I’ve thrown more gatherings that take a week of active preparation and a month of thought and planning than I can count. I love the production—the design & thought that goes into hospitality and creating an experience for guests, be it a coming together around a table or one of the retreats I host around the world, inspire me endlessly. I’m a detail oriented lady, and I like to imagine every event I put on, big or small, from the minute a guest walks in to the minute they walk away and plan for each moment of their experience accordingly. That said, life is busy. I know very few people with that kind of time on their hands unless it happens to be part of what they do for a living or their hobby. But just because life is going by faster than the Shinkansen (the high speed railway in Japan, from which I am currently writing this post! 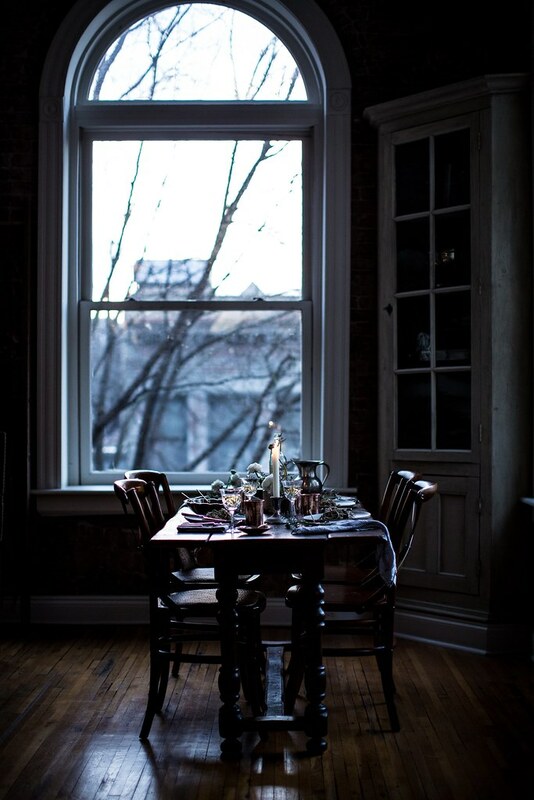 ), that doesn’t mean we can’t all enjoy a gorgeous table & homemade food. 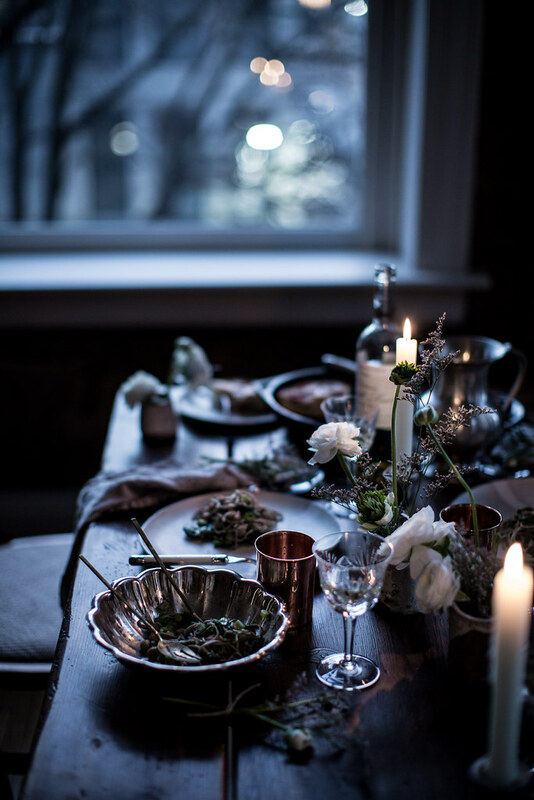 That’s why I wrote these tips for setting a simple but lovely table & cooking a minimal but wholesome menu in one hour. That’s all. 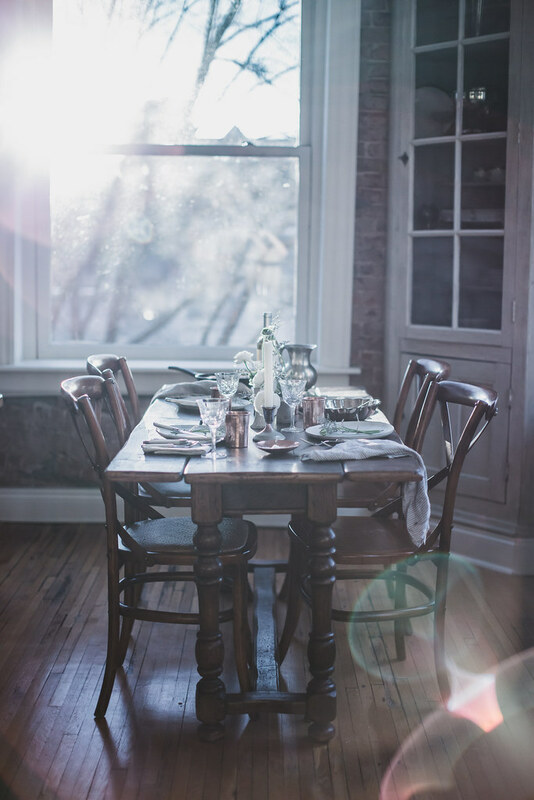 So if you happen to have unexpected guests dropping in; are just generally pressed for time due to kids, work, or both but don’t want to sacrifice the slow pleasures of the table; or are (like my pregnant self) tired and struggling with getting much done be it due to physical difficulties or otherwise, here are some photos to inspire your next table setting + my 10 tips for throwing the quickest dinner party in the history of dinner partying. Keep fresh flowers in your home. And then steal them from yourself to create a humble centerpiece of fresh flowers or foliage. I tend to keep flowers in the house, so I just grab them from elsewhere in my home or (especially during spring like it is right now!) pop outside and clip some from my yard or neighborhood. A little green on the table goes a long way. A few candles to set the mood. 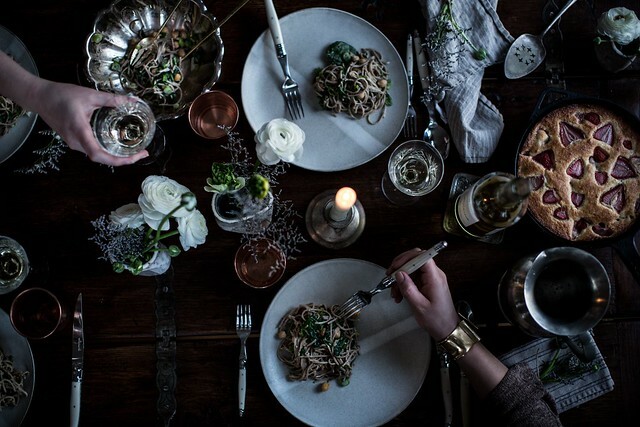 A bit of flickering flame makes even Tuesday night dinner feel luxurious. Your candles don’t need to match, just throw a few on there to set the mood. That said, I like to stay away from scented candles at the dinner table! Keep the menu simple—3 courses max! I stick to 3 courses (a green salad, a one pot meal, and an easy dessert) and flesh it out with bread and olive oil or butter if I think I’m dealing with a ravenous crowd. But usually we don’t need the bread. Keep wine on hand. I like to keep a few bottles of good red and white for when guests pop in so there’s no need to run out to the shop. I like Kung Fu Girl Riesling and Boom Boom Syrah for economical but delicious options. Music! Turn on the record player (my personal, ambient favorite), the Spotify, or the iTunes and queue up your favorite mellow songs. I keep the volume low so it doesn’t drown conversation but high enough to set the mood and make the evening more lively. 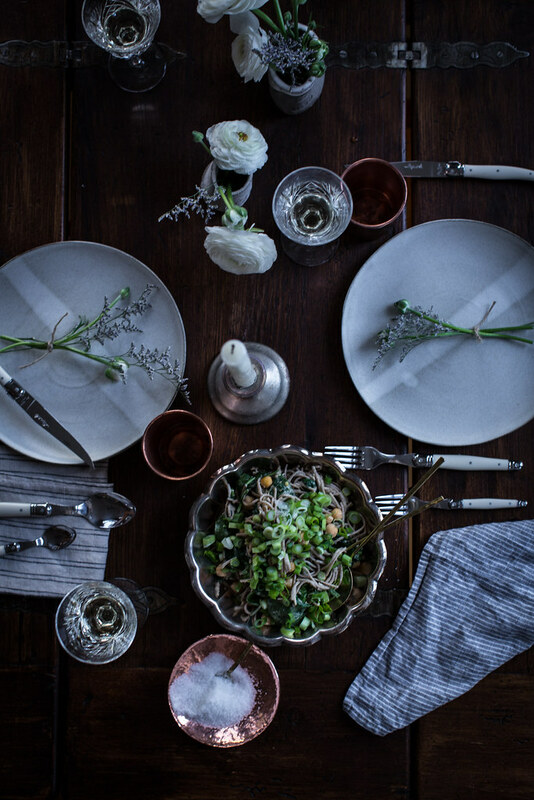 Mix and match your table setting with abandon. Mix old and new, patterns, textures, what have you. If you’re like me, most of what you own will be your style and will mix seamlessly. No need to over think it. Mom’s heirloom crystal with copper tumblers from Yield Co.? Why not! Don’t overthink it. Grab and go. Don’t forget to heat the oven! If anything will be going in the oven, make sure you turn it on first thing so you don’t have to wait around. After that you’ll want to start your cooking from the longest cook time to the shortest. Don’t forget that your dessert can bake while you enjoy dinner, no need to have it out of the oven when guests arrive or you sit down. Dress your salad like an Italian. Olive oil, maybe a little sea salt, a splash of vinegar or squeeze of lemon. Fresh herbs to liven up the best greens you can find. I love a salad that’s nothing but green. If you must, a bit of cheese, citrus, and nuts easily elevate humble greens. Make a one pot meal and skip the sides. I like pastas, Japanese hot pots, soups & stews, risottos, tarts, or even the long forgotten casserole. For this gathering I made soba noodles with chickpeas, spinach, scallions, and a tahini miso sauce. Healthy, plant based, and incredibly quick and easy. Recipe coming up in the next post! One bowl skillet cake! Or galette! So quick & easy yet so delicious and special. The one I made for this party was a skyr (icelandic yogurt), buttermilk, thyme, and berry cake. Recipe also coming soon! Making it with berries like blueberries, blackberries, and raspberries (as opposed to strawberries) is even quicker because no need to slice! A little fresh whipped cream or ice cream make it even more special but neither are necessary. I mean, it’s not a party without cake right? That said…the humble galette has long, long been my other go to in a pinch! I keep pie dough in the freezer. It’s a life saver. Happy gathering! Stay tuned for the recipes & you can follow along with our current Japan travels on instagram & snapchat (username = localmilk)! Spot on. 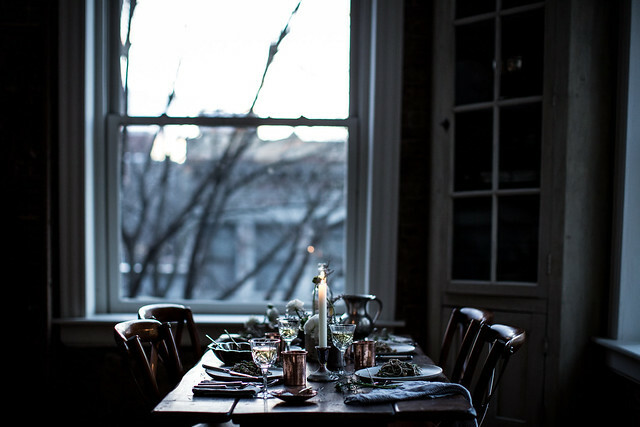 Some of the best dinner parties I’ve thrown or attended have been the simplest or most slapdash. Thanks for sharing the beauty to be found in spontaneous gatherings. These are great tips, as indeed I expected them to be. I tend to follow most of them, except for the fresh flowers, I am highly allergic so only have fake flowers in my home – because I do love the explosion of colour flowers bring to the house I keep several types of fake nes that I change yearly according to seasons – and the salad: I have to have tomatoes in my salad, it’s a thing with me, I am a sucker for tomatoes!! Can’t wait for that cake recipe, although I know I cannot find skyr here in Portugal, can one substitute it for any other type of yogurt? I’ve lived in countries where fresh flowers are hard to find and I just took fruit and piled it in a glass vase (or bowl). A friend, creative herself, was so impressed, asked if she could take a picture of it. oh, that’s quite a good idea, actually!! Thanks, Janet! 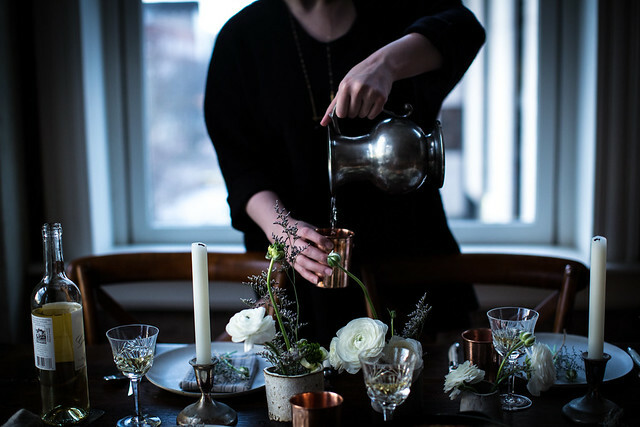 I love these tips… I have never hosted a dinner party before but I’m afraid I’ll over complicate things! I love having friends and family over for diner ! Now I’ll be ready anytime thanks to your tips and tricks. Love the table setting Beth! Enjoy Japan beautiful mama. Love this! 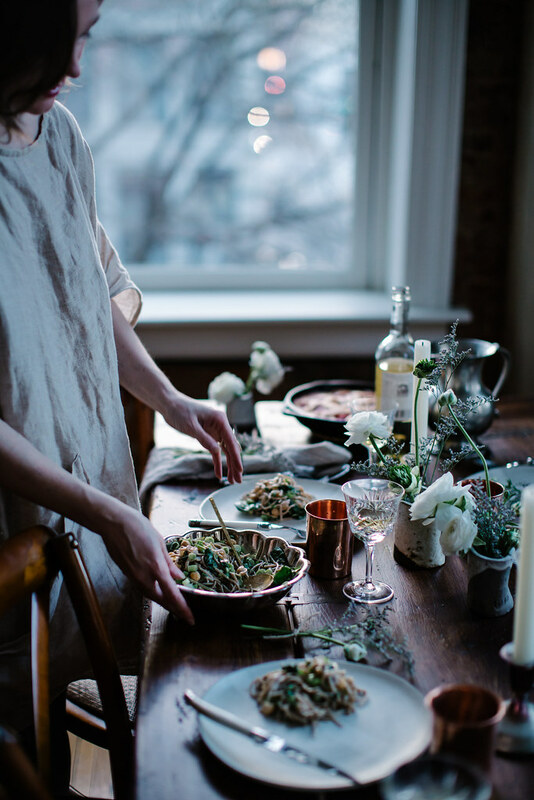 I used to throw dinner parties all the time, complicated, time-intensive little gatherings with themes and eight courses. This is the perfect inspiration to get back into it with a more relaxed attitude. Thanks, Beth! Wonderful photos as always. I look forward the recipes . You are a great inspiration in every single post. 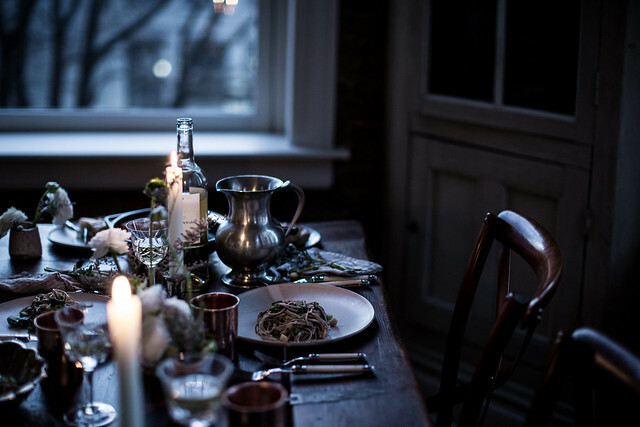 I’m a huge fan of your gatherings, I’m even thinking in starting a series of those here in Mexico, and I hope you can answer this little question: what kind of music do you prefer for a dinner party, any Spotify playlist in mind? 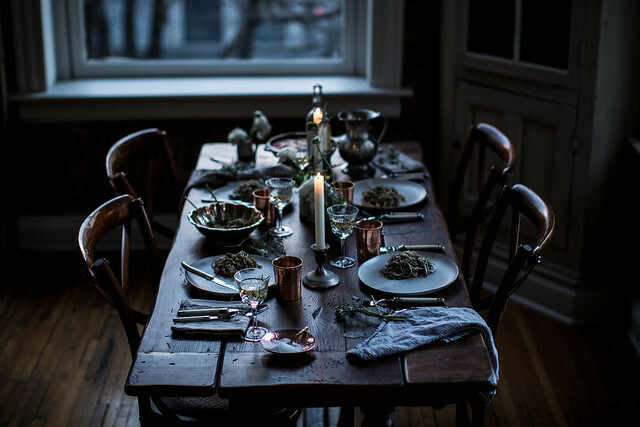 I just wish I have the guts to throw more dinner parties in a whim! I always seem to overthink…..
Great tips! 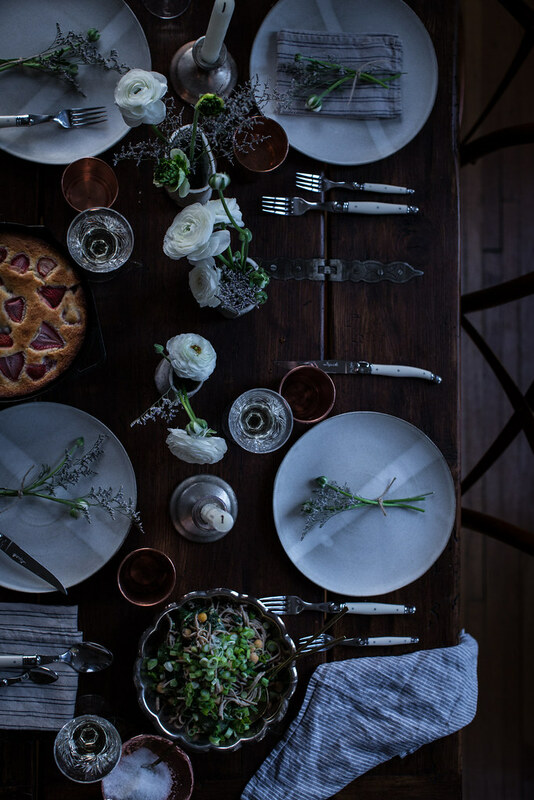 And what a gorgeous table setting! 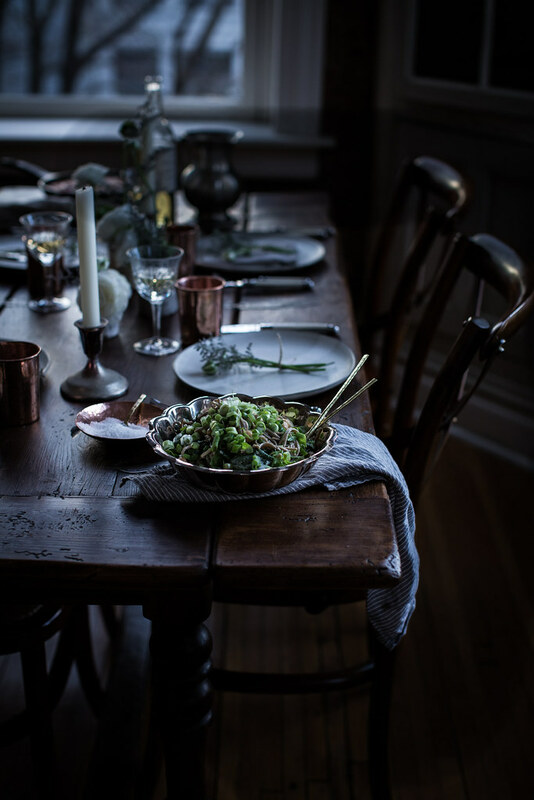 Great tips – I always try to go all out when I host dinner parties as I think people always expect something spectacular. All we really want is good company and delicious food. Whenever I entertain I make waaaay too much food. 3 courses is a great idea- small enough to be manageable and easy, but large enough to feel special. 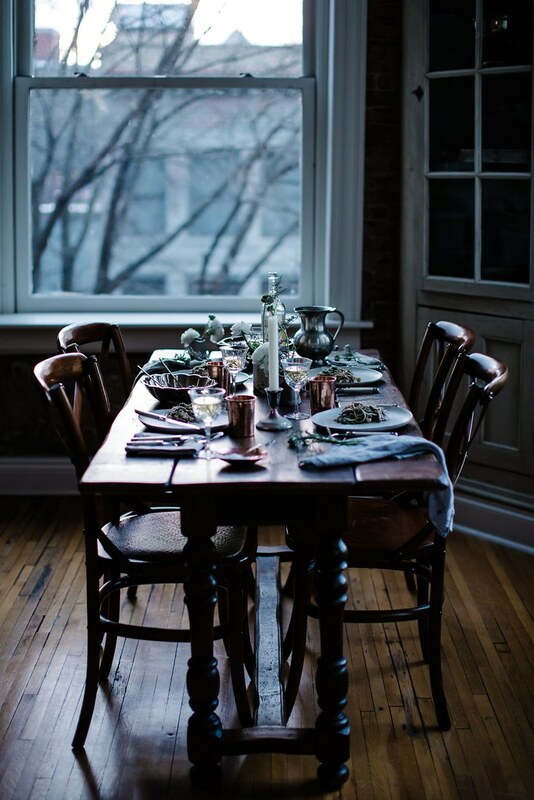 Thank you for the great advice and the beautiful table inspiration. 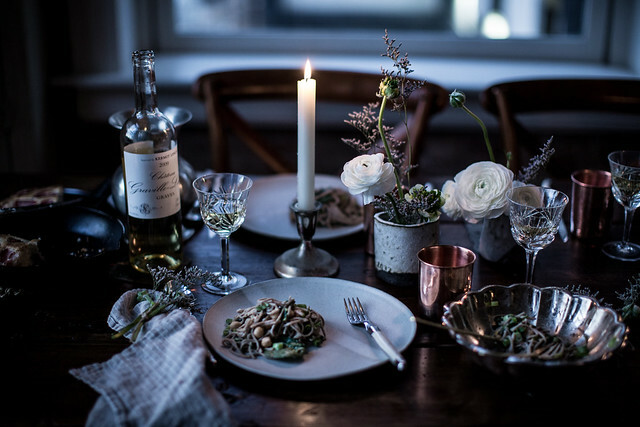 I love this beautiful table setting! I am new to this blog (thanks Bon Appetit!) and feel deliciously immersed…can’t wait to really dig in. 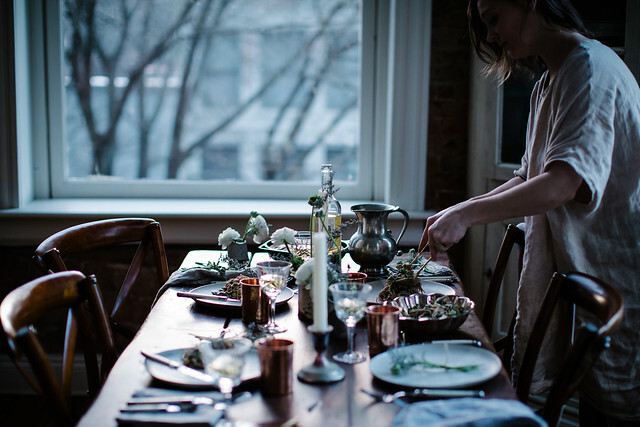 Beautiful table and food…but I am also admiring your linen dress…who made it? Thanks! Loved your post…this resonated with me because it is how I enjoy doing things. Beautiful! I was definitely needing this tips! The pie dough that you keep in the freezer… is that one you make at home? How long it lasts before spoiling ? always inspired by your posts! Beth! I adore everything you put out into the universe! 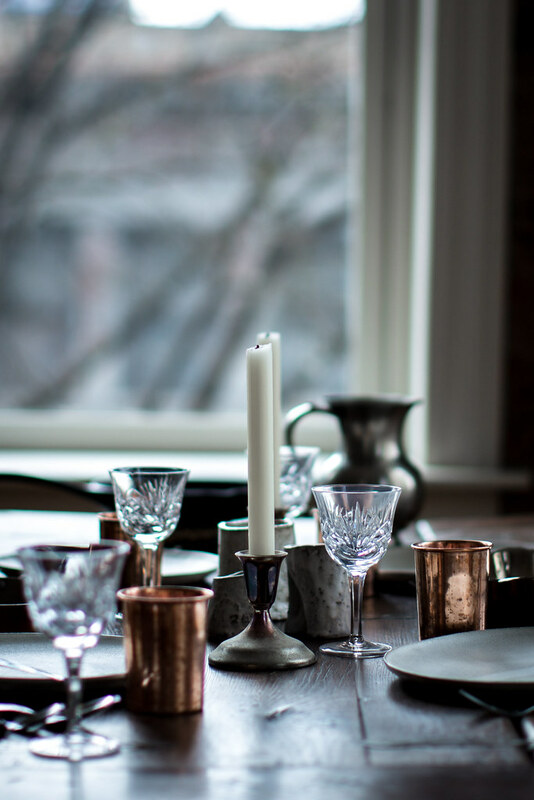 I LOVE your copper cups-where are they from? Thank you for these tips – this is genius! 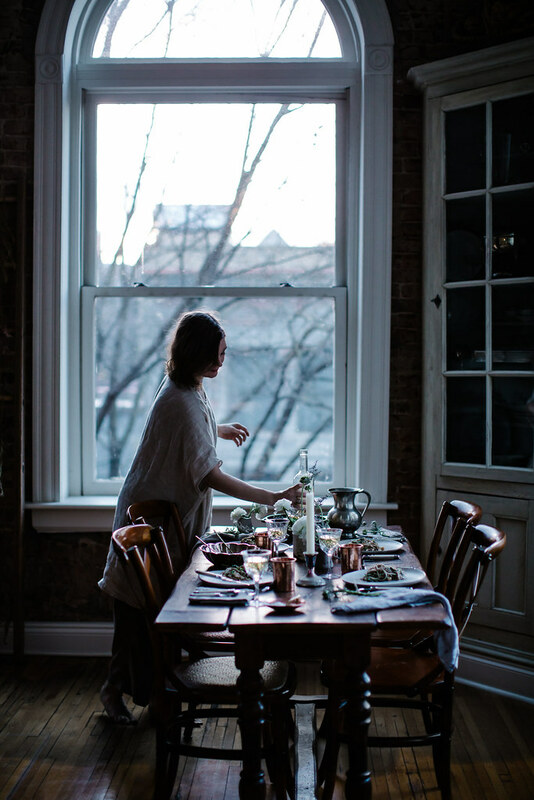 It will help me a lot because I’m no domestic goddess and usually get overwhelmed if I have to host a dinner party. I love the fact that it takes little to create a beautiful atmosphere.